As of 12:34 am on Friday, that is now my age. See, I don't mind revealing that fact, because I don't feel 35 (whatever that is supposed to feel like). I don't think I look 35 either, but that is all subjective. I always thought I'd be taller when I reached this age. Kinda disappointing. n! The service was excellent (and fast) as well. I went off to a 90 minute massage from the best masseuse in town (in my opinion of course) while Darren did some running around. Afterwards, we strolled leisurely to the other side of town for lunch at the Tasting Room. They have this incredible four cheese fondue served with warm thick-cut bread that is absolutely perfect with Monteith's Summer Ale (draft, of course - yes, Kiwis! It's still on tap for at least 2 more weeks!). he Whales exhibit. Wow! Did you know that whales were once land mammals? It totally makes sense, but I had never thought about it fully before. I had learned as a child that reptiles came from the water and evolved further on land, but never considered that mammals had gone the other way. And why not? How else would the ocean mammals (whales, porpoises, dolphins) have gotten there? The exhibit (which did not allow pictures) also had a replica of a Southern Right Whale's heart. It was massive! Several children were crawling around inside the thing! There was also a "soundings lab" where we listened to the different calls whales make when communicating with each other or hunting. Some types of whales even have regional dialects for their 'songs'! Fascinating and beautiful. The Maori legends of whale-riding were also a part of the exhibit. 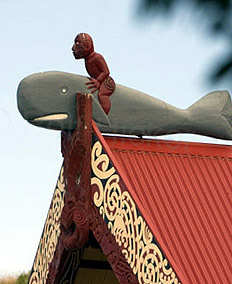 The (general) Maori word for whale is "tohora"; whales are quite important to the Maori and often are represented in the carvings of the wharenui (meeting house) and pataka (food storehouses). We headed home from the exhibit to relax a bit and get ready for the evening's activities: drinks and a comedy show with my co-workers. The event was planned as one of our quarterly get-togethers, and it was brilliant! We first had drinks at a newish bar - The Four Kings - which was quite loud, but at least one of the bartenders poured a Guinness (mostly) right. It was really good to spend time with my co-workers outside of work and meet (read: shout at) their partners, too. The comedy show was part of the New Zealand International Comedy Festival, and featured four comedians from around the world: Ireland, America, England and Northern England (Geordie). They were hilarious! My company is quite an international company with employees from the US, Canada, Ireland, Austria (oy! ), Germany and England. Nobody was safe! Especially the Austrians, as you can imagine. It was all in good fun, though, and we laughed so hard our faces hurt! On Saturday night, we continued the birthday celebration with a leisurely dinner at our favorite French restaurant, Cafe Bastille, which just happens to be around the corner from our house. How convenient! The restaurant was warm and cozy, and had a three-piece band (one fiddle player and 2 guitar players) playing soft french music. We ordered a glass of a NZ Gamay Noir that was delicious by itself but also complimented our mains (steak for him, duck for me and a side of truffle mash to share) quite well. And speaking of the food...it was gorgeous, beautiful - brilliant even! Before moving here, I had never described food in such a way. I don't know if it is because the food is better here, or if we just couldn't afford to eat at the restaurants that served such food in the US. There really are no other words; 'delicious' just isn't strong enough. We savored our mains as long as possible - it was quite a struggle to eat slowly! The desserts were as equally fabulous (apple tartlets for me, chocolate mousse for Darren), and served with a complimentary glass (each) of a perfectly matched dessert wine. Dawn you look so Purty! You had a birthday!! Awww I didnt know!!! Happy Belated Birthday sweetie!!! Sounds like you had an amazing night, well deserved and by heck you look gorgeous! !